Ever since Macedonia became a successor state of the former Yugoslavia and declared its independence in 1991 it has remained unnoticed. This is due to the fact that Macedonia, officially the Republic of Macedonia is country that is landlocked right in the heart of the Balkans and one of Europe’s youngest and smallest countries. However it does have a lot of beauty to offer tourists. There are wild mountains, fertile plains and huge lakes. Its capital Skopje sits on the upper course of the Vardar River and is located on a major north-south Balkan route stretching between Belgrade, Serbia and Athens, Greece. This lovely city is well worth taking a look at. The small Church of the Holy Savior (Sveti Spas) can be found behind a massive wall with its wooden bell tower peaking out. Steps from the courtyard lead down to the church dating from the early 19th century. It was built upon the ruins of another church destroyed by fire in 1689. This church has become well-known for its wood carvings. Here the icon screen displays some of the best Macedonian carvings. This art work was created by Petre Filipovski Garkata and Marko and Makarie Frckovski between 1819 and 1824. These wood carvings have Biblical depictions as well as the local flora and fauna. There is even a small self-portrait of the artists at work. You can also see the grave of Macedonian revolutionary Goce Delcev (1872-1903) and a small museum dedicated to him. 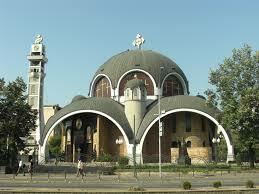 A very impressive sight is Skopje’s modern Orthodox Cathedral – St. Kliment Cathedral. It was built in 1972 by architect Slavko Brezovski and consecrated in 1992. It consists completely of arches and domes. There is a massive chandelier that hangs from the ceiling and it features a 70 sq. m. Jesus Pantocrator painting. 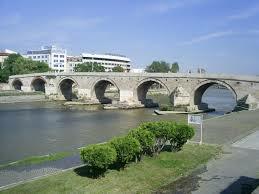 The old Stone Bridge spanning the Vardar River is Skopje’s landmark construction and has 13 arches. The city was founded on Vardar’s left bank at the confluence of the Serava River. The bridge was built by the Ottomans in the 15th century. This is an important pedestrian link between the old bazaar area and the modern part of town. Along the span of the bridge you can see stalls where some merchants sell their wares. Mother Teresa House is found not far from the City Museum. Mother Teresa was born in Skopje and lived here until she was 18. The original house is no longer there but a lovely modern chapel and interpretive center has been built on this site. 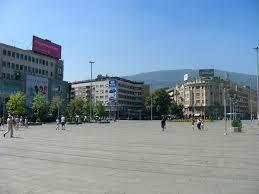 Macedonia Square is a vast square where people come to gather. Its most impressive building is the Risticheva Palata at the south end. The main focus of the square is the Stone Bridge. In the warm months of the year concerts are given here. 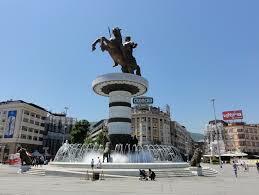 Right in the center of the square you will see a large statue – the main symbol of Skopje – the Warrior on a Horse. This is a statue and a fountain thought to depict Alexander the Great. This monument was built in Florence, Italy to commemorate 20 years of the independence of the Republic of Macedonia. The massive bronze sculpture sits on a cylindrical column that consists of three large ivory sections. Each of the sections contains reliefs. The column has been mounted in a fountain. At the base there are eight bronze soldiers. Eight bronze lions surround the edges of the fountain pool. Four of them release water from their mouths and this incredible fountain also plays music. In Pella Square you’ll find Porta Macedonia a triumphal arch. This arch was also dedicated to the 20 years of Macedonian Independence. The outer side of the arch has reliefs that have been carved in marble and depict scenes from the history of Macedonia. Within the arch you’ll find interior rooms among them a souvenir shop. There are also elevators and stairs to provide access to the roof. To delight in a world of art go to the Contemporary Art Museum. Its permanent collection highlights some 3,000 art works from more than 60 countries and includes paintings, graphic art and sculpture from artists like Hocknet, LeWitt and Picasso. Interesting to see is the City Museum housed in the old train station. It features two small collections on two floors. At the ground level you can see changing exhibitions that are related to the culture, people and history of Skopje. Down below though dimly lit are fine examples of ancient piece that have been dug up in the area. The pride of the museum is the 6000 year old 15 cm clay Adam from Govrlevo statue. This statue is ranked among the world’s top 10 Neolithic artifacts and it might be the earliest representation of a human figure. It is advisable for visitors to this museum to take along a professional guide since nothing is marked in English. Like with any city that had a bazaar, Skopje has a clock tower that at one time told merchants when to close their shops a few times during the day for Muslim prayer. This hexagonal clock tower was built between 1566 and 1573. It was built half with sandstone and half with bricks. There is a clock mechanism from Szeged, Hungary. For relaxation from the city streets there is Gradski Park. This park was created in the 19th century to the north and northwest of the city center. It is a very popular place among residents in the warmer months. The park was built on the site of a former mosque and several columns can still be seen. 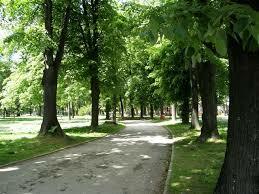 Here people enjoy walking and picnicking on the northern edge of the park where the Vardar River flows. There is also a path for bikers and roller bladders. There is a large sports hall and tennis courts and a small stage for performances on summer weekends. High over Skopje is Mount Vodno well-known for the huge Millenium Cross at the top. 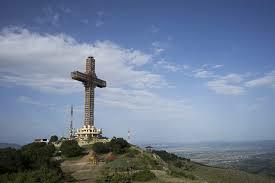 Hikers can take a walk up to the peak to get a better look at this cross. At the top there are panoramic views of the city and valley below. The Millenium Cross is the largest Christian cross in the world and it was built to celebrate 2000 years of Christianity. Here tourists can also see a monument that was dedicated to Macedonian partisan fighters who defeated Axis forces stationed on Mount Vodno allowing for the liberation of Skopje to begin. A public bus takes people to the middle of the mountain and from there a cable car goes all the way to the top. So if you are not a hiker who might want to break out into the song “Climb Every Mountain” while heading for the top then you can take the transportation. 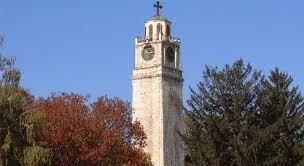 Get to know Skopje, it is a most interesting and beautiful city.